Rocky Coast Joinery specializes in custom built Shaker and mid 1800s style furniture. Offers turned wood platters, bowls, trays, vases, wood music boxes, and small wood toys made from hardwoods common to our urban forests. The Wood Master Hot Water Outdoor Wood Furnace - Install your Wood Master furnace next to the wood pile for convenience and safety. The Wood Master furnace comes ready for set up, completely wired and plumbed. Offers handcrafted pens made from wood, antler and acrylics along with many other pieces of art from the wood lathe. Wood and custom cutouts, unfinished wood and tolepainting kits. Wholesale wood parts for crafters and tole painters specializing in wood balls, wood cutouts and projects ready for painting. Gallery of handcrafted wood pens and key chains, and workshop pictures. Information on woods used, wood turning and pen making. Manufactures wood turnings to your specifications, including spindles, knobs, handles and commercial wood pieces. Wood, imitation wood, and aluminum blinds custom made for order. Handmade wood designs, epoxy coated pine, oak, and cherry wood. Night lights and wall hangings, indoor and outdoor designs. Hand turned wood magnifiers, letter openers, pens, pencils, jewelry and gifts. We also have hand carved wood spirits and carved golf balls. Wood For Industry is a company with over 20 years of experience in the manufacturing of custom wood constructed units to meet your design or we will design a unit to meet your needs. Offers wood carving supplies such as Quackwood Knives, knives by Bill Pallmer, Pfeil woodcarving chisels and gouges, Foredom carving tools, and Razertip wood burners. Handcrafted wood folk art and home decor in holiday themes. Online wood working projects for novice and intermediate wood crafters. Patio and wood furniture available in many choices of wood and finishes. Variety of custom wood craft home decor items. Provides cue building machines, shaft wood, and exotic wood. Creators of handcrafted wood furniture and wood products. Country gifts and sewing accessories made from wood. Handcrafted wood art, nativity scenes, dogs and plaques. Offers handcrafted wood furniture from a number of artisans in Canada. Offering pre-cut wood tole and decorative painting kits. Handmade wood furniture gliders from Montana. Seasonal and holiday decorations made out of wood. Handcrafted pens and pencils made from the finest grades of wood. Hand carved wood walking canes, and figurines. Wooden neckties in various colors and unique styles, all made from wood. Wide variety of catalog wood supplies and woodcraft parts. If the business hours of Rocky Coast Joinery in may vary on holidays like Valentine’s Day, Washington’s Birthday, St. Patrick’s Day, Easter, Easter eve and Mother’s day. We display standard opening hours and price ranges in our profile site. We recommend to check out rockycoastjoinery.com for further information. 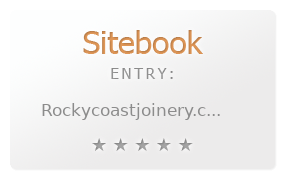 You can also search for Alternatives for rockycoastjoinery.com on our Review Site Sitebook.org All trademarks are the property of their respective owners. If we should delete this entry, please send us a short E-Mail.